1. All rates are for double occupancy per night. Additional guests are $20.00 per person per night. 2. All prices are subject to 5% bed tax. 3. Check in: 4pm-7pm , unless prior arrangements have been made. Check out 11am. It is your responsibility to inform us if you will be a late check in before 7pm of the date of your reservation. Your credit card will be charged at 7pm on your reservation date. An envelope with your name, cabin location, key, additional information and receipt of charges will be left in the drop box at the office for your late arrival. We are a small lodging provider,if our staff is not in the office they are housekeeping or fulfilling other duties on site. They can be reached by calling the phone number provided on the office door. 4. Children under 8 years old stay free. 5. No smoking in the cabins,$500.00 cabin cleaning fee will be charged and immediate removal from property for indoor smoking. Smoking is allowed outdoors on the grounds. Incinolet electronic toilet instructions are posted in the bathrooms of Beaver Point and Bird Cove and need to be followed exactly as written. Failure to follow these instructions will result in additional charges to your bill for cleaning, repairs or replacement of unit up to $2,800.00. 6. Pets are allowed subject to prior approval and additional fees. 7. All online reservations require all type of payment information at booking to hold the reservation. 8. All reservations are subject to a $50.00 processing fee if the reservation is cancelled. Reservations cancelled 14 days or less before check in will forfeit 100% of reservation. 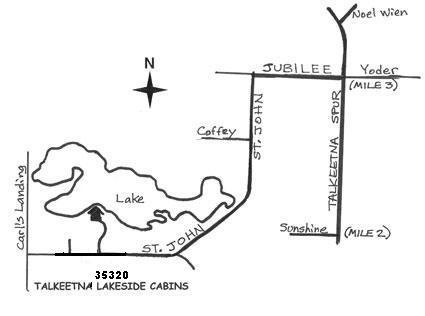 Talkeetna Lakeside Cabins will rebook cancellations at our discretion. 9. No refunds for “no shows”, late arrivals or early departures. 10. Talkeetna Lakeside Cabins accepts Visa, Master Card and Discover credit cards.